18 August 1908: Entered the Austro-Hungarian Army as a Leutnant in Infanterieregiment Erzherzog Joseph Nr.37. 1914-1916: Platoon and Company Commander. 1919-1920: Officer in liquidation service with various replacement offices; in the Southern Steiermark Border Defense Command; Leader of the Homecoming Consultation to the Land Commander of Steiermark. 1921: Administrative Officer in the Army Administration of the Homecoming Group to the Land Commander of Steiermark. 1 April 1920: Group Leader for Organization in the Graz Army Administrative Office. 1 July 1923: Transferred to Alpenjäger-Regiment 10. 25 October 1924: Doctor of Law (Dr. jur.). 3 March 1925: Aide to the leadership of Brigade Command 5. 6 June 1925: Transferred to Infantry Regiment 5. 1 February 1926: Returned to Alpenjäger-Regiment 10. 1 April 1928: Allocated for service in Brigade Command 5. 28 March 1930: Allocated for service in the Graz Army Administrative Office. 1 August 1931: Leader of the Graz Army Administrative Office. 15 October 1933: Transferred to Brigade Command 5. 15 February 1935: Chief of Staff of the Klangenfurt Military Command. 1 August 1935: Chief of Staff of the 7th Division. 1 December 1935: Transferred into the Operations Department of the Federal Ministry of National Defense. 1 October 1936: Chief of Staff of the 3rd Division. 15 March 1938: Accepted into the German Army. 1 April 1938: Transferred to the staff of the 45th Division. 10 November 1938: Transferred to the staff of Infantry Regiment 30 of the 18th Infantry Division. 26 August 1939: Army High Command Leader Reserve. 1 April 1942: Army High Command Leader Reserve and, at the same time, delegated with the leadership of the 370th Infantry Division. 13 September 1942: Army High Command Leader Reserve. 20 November 1943-24 January 1944: Commander of the 4th Field Division (Luftwaffe) on the Eastern Front in static positions north of Vitebsk, Russia. 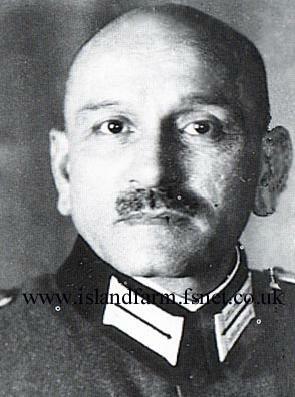 15 March 1944: Commander of the 133rd Fortress Division on Crete. 9 May 1945-1947: Prisoner of war. German Cross in Gold: 30 October 1941, Oberst, Commander of Infantry Regiment 526.